The term vitiligo refers to loss of pigment of the skin. There are many hypotheses explaining why some people get vitiligo which is though to be mediated by an auto immune process-meaning the pigment producing cells ‘melanocytes’ are under attack from the body’s own immune system. It is not uncommon and the impact of vitiligo on the patients confidence cannot be underestimated. 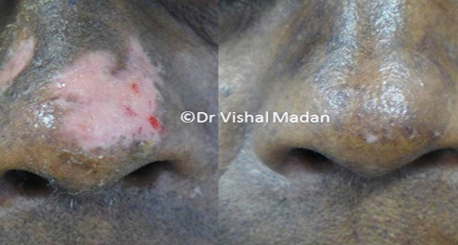 Treatment depends on the extent of vitiligo, patient’s age and availability of treatment. Vitiligo treatment options are topical steroids, the newer immunomodulator creams, light therapy and surgery and more recently, melanocyte transfer. One such treatment is Renovacell.